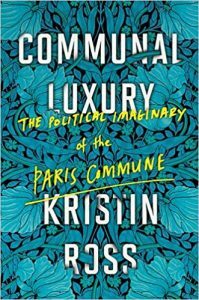 Ross’s Communal Luxury is a ‘sketch’ of the Paris Commune and ‘Communard thought’, the political practice and theory of the insurgents and their supporters. The book delineates the components of a specific imaginary that survived its nineteenth century origins in the new communal regime to reconsider ‘Communal luxury’. Communal luxury involves the extension of art into life; this is a style or way of life ordered by an aesthetic dimension. Luxury traditionally signified the selfish pursuit of personal wealth, but it could be radical, connoting the possibility of disordering social hierarchies and obvious class belonging through kinds of fashionable and therefore deceptive appearances. Often it just signified indolence and lasciviousness. Communal luxury has a different content. It is an aesthetic and truly luxurious life that emerges from abundance. Although not individually selfish, it preserves individual pleasures to expect that men and women collectively and reasonably, using the wealth that nature provides, will produce pleasurable or enjoyable things. Communard thought survived in the writings of Marx, Morris, and Kropotkin. So for Marx, the Commune was a completely new historical creation which, Ross argues, transformed his understanding of revolution, civil society, and the state and class rule. The Commune’s democratic reforms which superseded class rule embodied in the existing state machinery and therefore ‘its own working existence’ which transformed Parisian everyday life, and the creative activity of the Communards developed Marx’s thought. Like Marx, Ross values the practical forms of life and democracy that the Paris Commune instigated, its mobilisation and distillation of existing and historical political and linguistic forms, and its internationalism: Marx (1974, 217) describes how the Commune ‘made a German working man its Minister of Labour’ and ‘honoured the heroic sons of Poland by placing them at the head of the defenders of Paris’. Ross discusses the embryonic forms of the Commune, which she emphasises were decentralised and autonomous, in workers identifying as citizens in quasi-Brechtian meetings and the clubs of Paris. The Commune affirms a politics already underway: it makes no sense to differentiate the rallying cries heard in the clubs from the actual event. Ross emphatically denies the Commune’s integration within nationalist or republican narratives, and stresses the internationalism of the insurrection: its ‘flag is the flag of the Universal Republic’ (21). The Women’s Union for the Defence of Paris and Aid to the Wounded, founded in April 1871 by a twenty-year-old Russian Elisabeth Dmitrieff, co-editor of La cause du peuple, focuses the Commune’s internationalism. The Union imported ideas of the Russian peasant commune into the experience of a large European capital. Dmitrieff met frequently with Marx in London and was a kind of conduit, Ross writes, between Marx and Nikolai Chernyshevsky, a cross-fertilisation that revitalised understanding of the commune and the possibility of thinking multiple paths to socialism. The Women’s Union grew rapidly during the Commune, meeting in almost all of the arrondissements of the city. To teach the child to love and respect others; to inspire in him the love of justice to teach him as well that his instruction is undertaken in view of the interests of everyone: these are the moral principles on which henceforth communal education will be based (42). More practically, the Commune aimed for a polytechnic or ‘integral education’ to overcome the division between manual and intellectual labour and develop mind and body equally to ‘promote the harmonious development of the individual’ (42). Ross introduces Eugène Pottier, poet, fabric designer, and author of the Internationale (written in June 1871), as a partisan for polytechnic education. Pottier was a member of the Artists’ Federation but overshadowed by its president, Gustave Courbet. (Interestingly, Ross remarks that during the Commune, ‘Courbet had become an artist in the sense that Marx gave to being an artist in The German Ideology – someone who, amongst other things, paints’ (44)). Ross highlights Pottier to focus the kind of emancipation the Federation envisioned and therefore elaborate her key idea of communal luxury. The overcoming of the division of labour towards which communal education strove is an essential production of luxury: everyone would have the luxury of playing with words and images. The Artists’ Federation envisaged the complete autonomy of art and therefore rejected state subsidies – understood as a kind of bribery – to be replaced by artists’ own cooperation and self-management. The Federation was preoccupied with artistic proprietorship, the rights of the artist over and to actually sign his or her work. Ross cites Adrian Rifkin’s suggestion that the famous shoemaker Napoléon Gaillard, the designer of the barricade at the entrance of the Rue Royal and the Rue de Rivoli, in effect signed his creations and therefore appropriated the status of author or artist when he had himself photographed in front of creations. Gaillard was anonymously and contemptuously ridiculed for his supposedly pretentious belief that his barricades were ‘both works of art and luxury’ (55). The Commune’s overcoming of the division between fine and decorative arts was short-lived, but during its brief existence their equality was taken for granted. ‘All art’, for the Communards, ‘was artisanal and skilled in its production and in the socialisation of its makers’ (58). The Federation’s manifesto, which did not prescribe a particular artistic direction, concludes with a sentence that gives Ross’ book its title: ‘We shall work cooperatively toward our regeneration, the birth of communal luxury, future splendours and the Universal Republic’ (58). At its most literal, the ideal of communal luxury could just mean public art but the demand the slogan evokes is more expansive and far-reaching, namely, the demand that beauty flourish in social spaces and therefore the later avant-garde expectation of the full integration of art into everyday life exemplified in Constructivism. Ross evokes the exhilaration of art freed from the museum and being lived as something ‘vital and indispensable to the community’ (59). The Federation’s demands exceeded the national spaces created by existing public monuments, centrally, that of the triumphal Vendôme Column, designed by the architects Jacques Gondoin and Jean-Baptiste Lepère from 1806. Its demolition, instigated by Courbet in May 1871, cleared the ground for the ideal of communal luxury, Ross argues. Ross denies the tragic account of the Commune by attending to its particularity and the political culture and new political forms that emerged from it. To delineate the ‘force fields of the movement’ or ‘relational web’, Ross considers the refugees who fled to England and Switzerland; the Liberal prime minister William Gladstone granted political asylum for Communard refugees. As such, the political culture that survived the Commune developed in Lausanne, Geneva, and London, where Paul Verlaine, Eugène Vermersch, Arthur Rimbaud, Édouard Vaillant, and Paul Larfague took refuge. The Commune was celebrated rather than memorialised in London. Switzerland, however, was less welcoming; economically, the refugees found it difficult to find work. Exiled Communards defended the Commune’s practice against anecdotal and sentimentalised accounts of its suppression, the massacre and summary executions of the Communards that appeared in the American press, a ‘counter-memory’, in which the honesty of a boy fighting with the Communards spared him execution, conceals the historical reality. They discussed the form revolutionary government should take and the nature of post-revolutionary society. The modern commune should not isolate itself by retreating within the protective walls of its medieval precedents – for Marx, a defunct form of social life with which the Commune did share a likeness. Ross considers anarchist views of isolated communist communes in terms of their weaknesses especially of size or scale. A commune could work, Kropotkin reflected, if it could include both city and country and be the same size or occupy the same territory as Idaho; but aware of the ‘tendencies toward the paranoia of the self-enclosed micro-society’ (123), Kropotkin detached the concept of the commune from geographical territories or scale to signify instead a school commune of equals. An “anarchist communism” was delineated in Switzerland in the late 1870s and 1880s, collectively invented by the refugees. Anarchist communism differentiated itself from the anarchism of Proudhon and Bakunin by abandoning the market and money, and taking ‘the complete extinction of exchange value [as] the central motor of the revolutionary process’ (106). The distribution of goods would no longer be dependent on labour contributed; goods would be distributed freely to everyone, even those who had not found work. Anarchist communism interests Ross because of its theoretical impurity and transcendence of reductive political oppositions, in these ways, it has contemporary resonances in the task of making socialists. She writes that: ‘A strategic position based on non-alignment, one that implies a slavish commitment to neither anarchism nor Marxism, and on association over sectarianism, may be well worth reconsidering today’ (111). Her book identifies and supports the cross-pollination of the thought of Morris, Marx, Kropotkin, and the geographer and anarchist Élisée Reclus. The Commune itself becomes a ‘medium’ from which ‘a new vision of revolution based on communal autonomy’ could emerge (111). Ross understands the fluidity of political identities and self-definitions in the aftermath of the Commune as something positive. Her argument is that a pragmatic non-alignment which is neither committed whole-heartedly to Marxism or anarchism could ‘be well worth considering today’ (111).